Photographing Glacier National Park wildlife is the experience of a lifetime. Learn the best places to view animals in Glacier National Park, including moose, grizzly bears, mountain goats, and big horn sheep, and wolves. Wherever you go in Glacier National Park, you will see animals. What wildlife you view depends on where you go and at what time. I’ve had a great deal of luck with viewing Glacier National Park wildlife. The only two animals in Glacier National Park that I did not see were Mountain Lions (fine by me!) and Wolves (although I did hear them howl at St. Mary’s Campground). My summers in Glacier National Park afforded me plenty of time to explore the park and its hiking trails. And now it’s my turn to share the secrets of viewing wildlife in Glacier National Park so that you can take pictures of mountain goats, big horn sheep, moose, and grizzly bears while remaining safe. 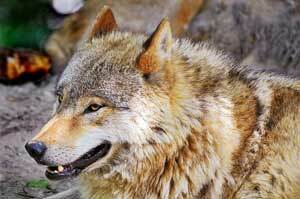 All wild animals in Glacier National Park (and the world for that matter!) prefer escaping the heat of the day. Therefor, the secret to viewing animals and taking the best pictures of Glacier National Park wildlife is to start your day early and end it late. 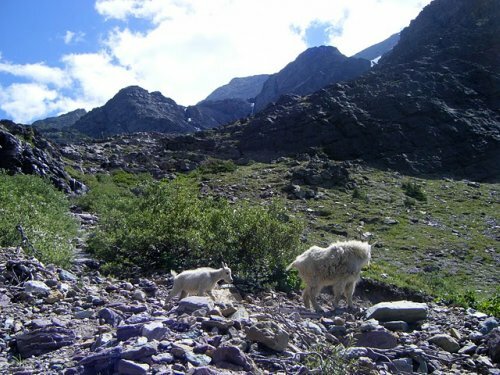 From 11AM until 5PM, most animals in Glacier National Park will be hiding to escape the sun. That doesn’t mean you can’t find Glacier National Park wildlife during these hours–it just diminishes the likelihood of viewing them. Logan Pass – Atop Going to the Sun Road is Logan Pass. 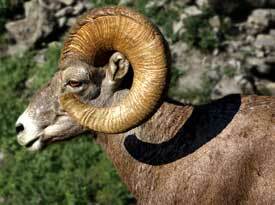 You will always be certain to spot mountain goats and big horn sheep grazing here. Here is my personal collection of the best pictures, photos, and images that I’ve taken of animals in Glacier National Park. Below each picture is a small description and where I viewed this wild animal. 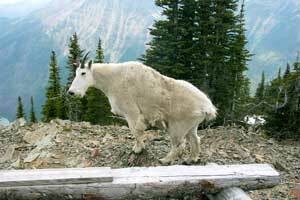 Of all the animals in Glacier National Park, I have the greatest collection of mountain goat pics. While appearing to be warm, fuzzy, and cute, mountain goats can be very dangerous animals if you get between them and their young. 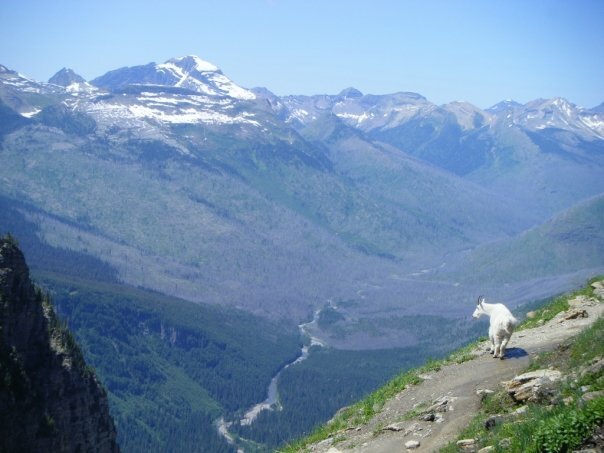 Be safe out there when hiking and viewing animals in Glacier National Park. 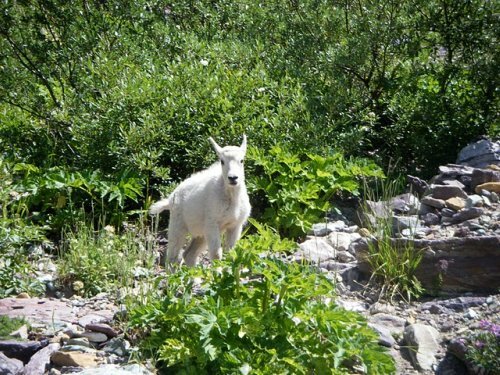 The first set of mountain goat photos is from The Highline Trail. This is the best mountain goat picture that I’ve ever taken. The timing was perfect along the Highline Trail and he was posing there, begging for a photograph. I whipped out the camera and snapped away. In the end, this is what we got. Thankfully, this fella didn’t want to leave quickly. He stuck around and let me shoot off a number of mountain goat pics. Later, the same mountain goat kept blocking our path. We tried climbing above him, but he wouldn’t have any of it. He turned around and marched right toward us. 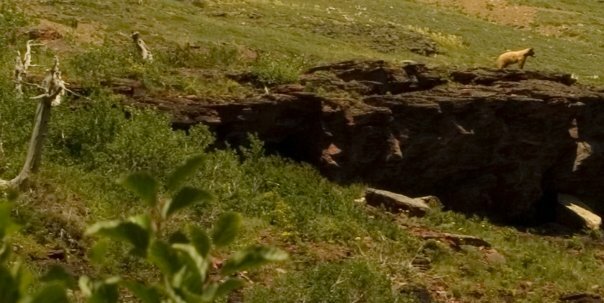 Since I had the camera in my hand, I had to take this mountain goat photo–but still way too close for comfort. Never get this close to animals in Glacier National Park. 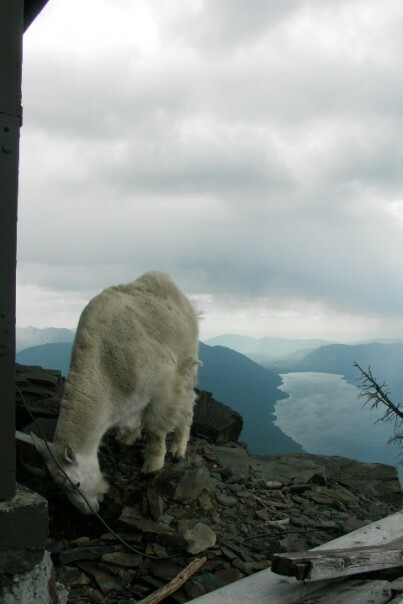 This mountain goat pic was snapped at the top of Brown Pass. You can see Lake McDonald in the distance and a storm brewing above the mountain goat. This guy always hangs around the top of Brown Pass. Plus, he loves to model for you! 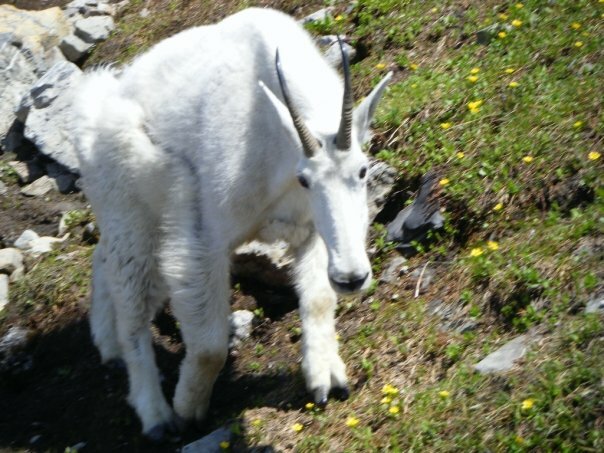 If you are dying to get up close and personal with a friendly mountain goat, then hike Brown Pass. 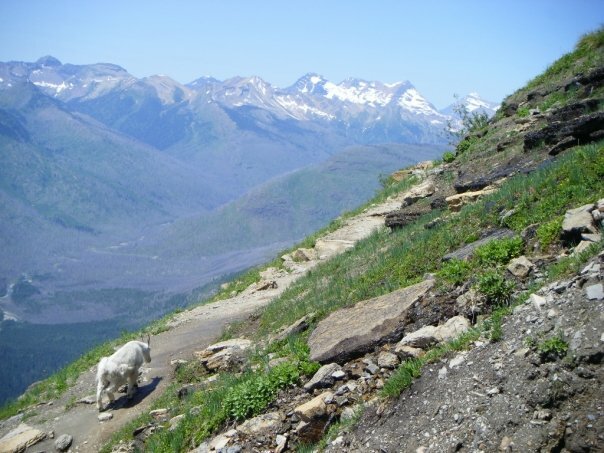 But I’m warning ahead of time–this is the most difficult hike in all of Glacier National Park. It climbs a few thousand feet in about 3 miles. These two mountain goats were walking along the trail toward us. We had to navigate below to let them pass peacefully. Although mountain goats aren’t typically aggressive, you never want to get in between a momma animal and its baby. That is way too dangerous, especially with Glacier National Park wildlife. There’s a large marsh on the Gunsight Pass trail in Glacier National Park. 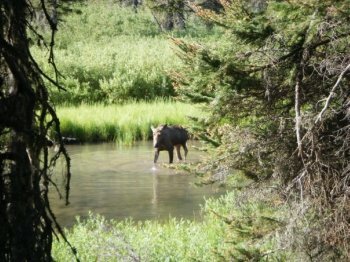 If you are hiking the trail, you may be lucky enough to see moose from a distance and snap a few images. 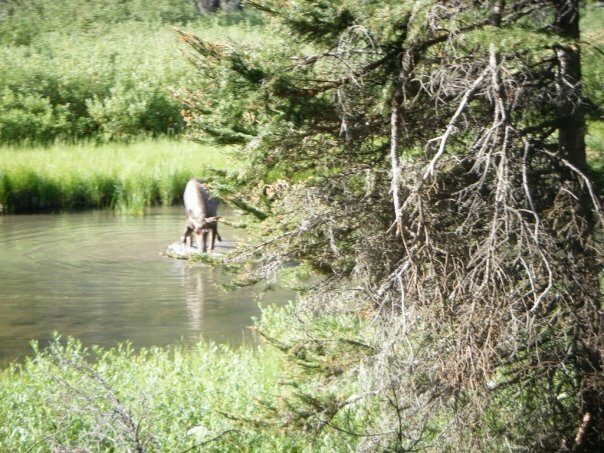 Here are the best moose images I took while hiking in Glacier National Park. This moose picture was taken bright and early. As I mentioned before, viewing and photographing animals in Glacier National Park requires you to be up at the crack of dawn. Since I was hiking Gunsight Trail in one day, we were on the trail by 7 AM and found this lady at around 9 AM. This moose picture has the lady looking directly at us. 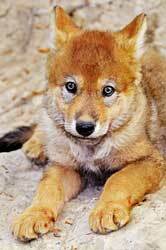 These animals are amazing. Long noses permit them to eat while eyes placed high on their heads allows them to keep an ‘eye out’ for other animals in Glacier National Park, particularly predators like grizzly bears. When hiking in Glacier National Park you must be aware that you are hiking through grizzly bear habitat. As such, you might see a bear. 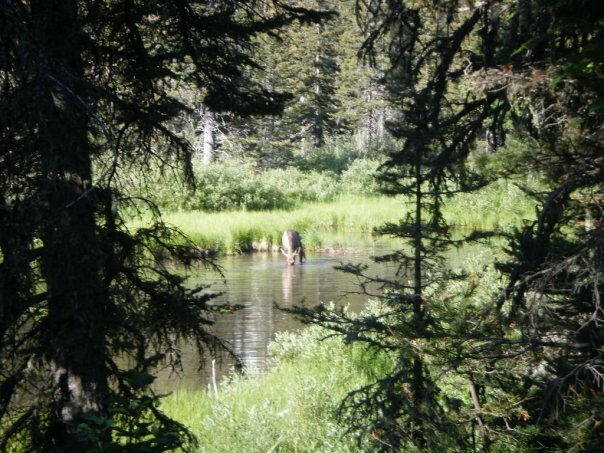 So long as you are adequately prepared with bear repellent and know how to hike through grizzly bear habitat, you will be safe. Still, grizzly bears are dangerous, deadly creatures. Do not underestimate them. Of all Glacier National Park wildlife, grizzly bears are the most dangerous. With that disclaimer out of the way, on my last trip I was lucky enough to take these grizzly bear pictures while hiking Iceberg Lake near Many Glacier Lodge. Many Glacier is one of the best locations for viewing and photographing grizzly bears in Glacier National Park and boy, did I luck out! 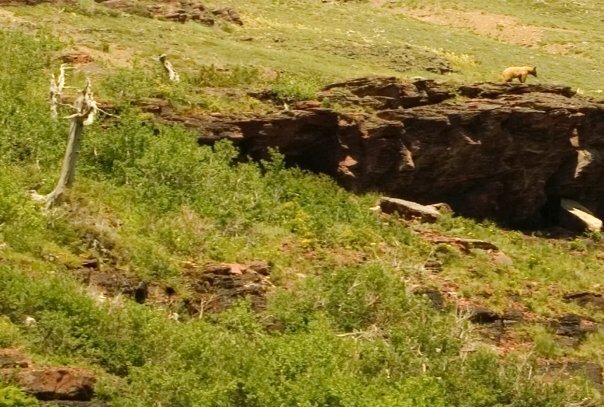 I noticed this grizzly bear walking in the grass to the left of the large red rock. He lumbered along as I fumbled getting my camera out. 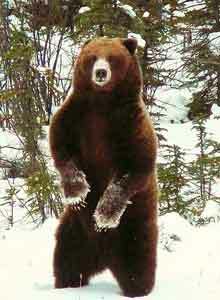 Finally, the grizzly stopped on the rock and sniffed the air, assessing the region. Picture of grizzly bear staring at us! With my camera clicking away, the grizzly bear turned and stared at us! I knew right after taking this image that I had one killer grizzly bear photo! 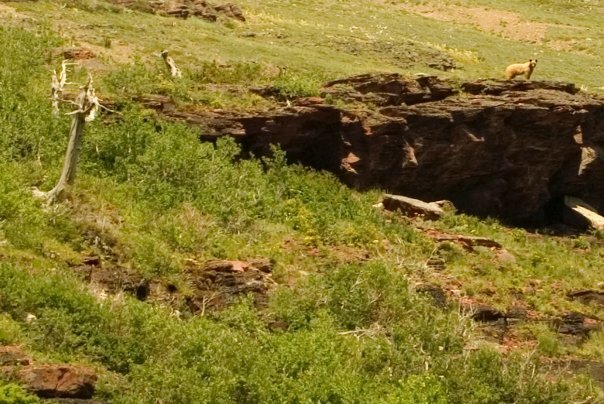 This grizzly bear image is from the same series but cropped. After staring at us and realizing we weren’t threats, the grizzly turned his attention back to, well, surviving. He sniffed the air a few more times and lumbered away. After a few exhilarating moments, the grizzly bear left. But, wow. What an experience. One that defined my latest Glacier National Park vacation and one that I will never forget. 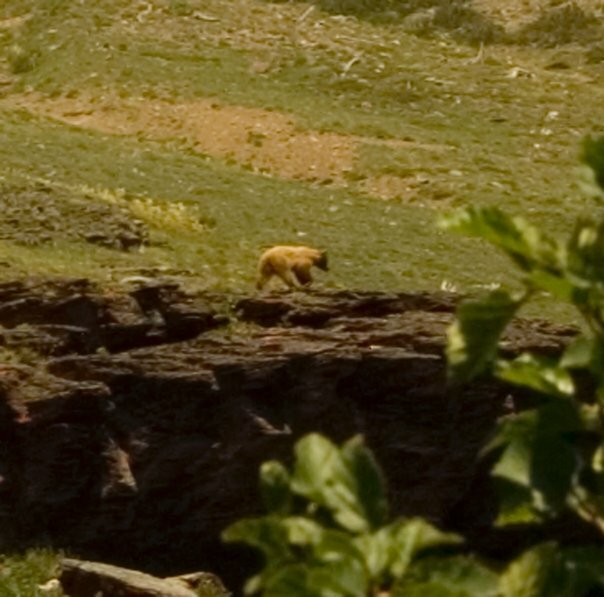 Of all animals in Glacier National Park, viewing a grizzly bear from a distance is the most lifechanging. We were so lucky to have safely watched this grizzly bear from a distance and observed it interact within its habitat. 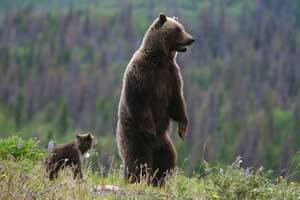 Of all the animals in Glacier National Park’s wildlife list, nothing is as impressive as an adult grizzly bear. Sadly, I never managed to see a wolf while in Glacier National Park. 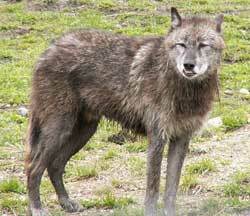 Of all animals in Glacier National Park, wolves are the rarest to see. 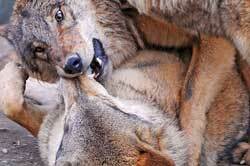 The sound of wolves howling is far creepier than Hollywood would have you believe. 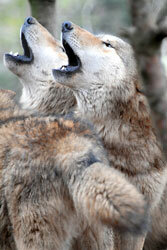 It sounds more like yapping hyenas than a romantic howl. Terrifying. Well, that concludes this section on animals in Glacier National Park. 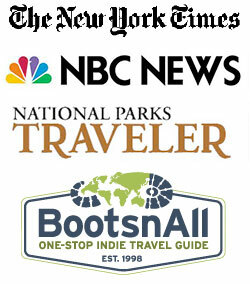 Hope you enjoyed the pictures, images, and photos of Glacier National Park wildlife.